In many countries around the world, “blasphemy” and “religious insult” are still crimes that can lead to prison or death. The campaign was launched after the Charlie Hebdo attacks in France in January 2015 by the EHF and the International Humanist and Ethical Union (IHEU) and aims at repealing blasphemy and related laws worldwide. It is now run by the International Coalition Against Blasphemy Laws which gather many international and national organisations. With this campaign, the EHF has also focused on the persistent blasphemy laws existing in EU countries and campaigned for their removal at European level. 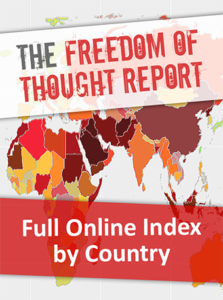 Our sister organisation, the International Humanist and Ethical Union, publishes every year a Freedom of Thought Report which provides a country-by-country overview of the rights and treatment of the non-religious in a number of key areas such as the consitution, education, family policy, freedom of expression, etc. Check the latest version below! 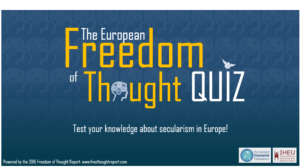 Based on the 2016 Freedom of Thought report, we prepared and educational quiz on freedom of thought in Europe. You might be surprised by the results! Click below and see if you score more than the average of 5 points out of 12!